Add a touch of detail to any event or gathering that you are planning. 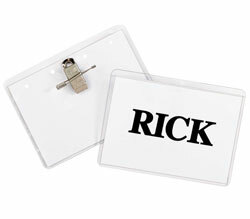 Use the name tent card and holder to personalize a meeting or conference in minutes. Create name tents and signs with your inkjet or laser printer. Cardstock scored for easy folding. Insert cardstock into reusable heavyweight plastic tent holder (sold separately) to display name or sign prominently. Sits on desk, table or any flat surface. Great for offices, conferences, meetings and more. Holds standard size business cards. Finished size 2 x 3 1/2. 40/Box.